It’s coming within the next year! Bakes On Mesh. From what I understand LL is making this so we can add on textures directly to mesh. We can use new and old it doesn’t matter! System clothing, old skins, old tattoos you name it, dig it out of your inventory and use it later. You can go back to layering textures like before 60+ layers. No need for the onion skin/several layers on the mesh bodies anymore (tat,undies,clothing). Just drop on the textures. NO HUDS anymore, no appliers anymore. It will be just like before mesh bodies only using the new mesh. Just wear it and it goes on your the body. When you wear a skin layer it goes onto everything so no need for each body part huds, no need for clothing layer huds anymore. This will be easy like it used to be pre-mesh before there was mesh anything. But like I said the designers and creators will have to update and make the changes too so we can all enjoy this. Strawberry Singh talks about it. 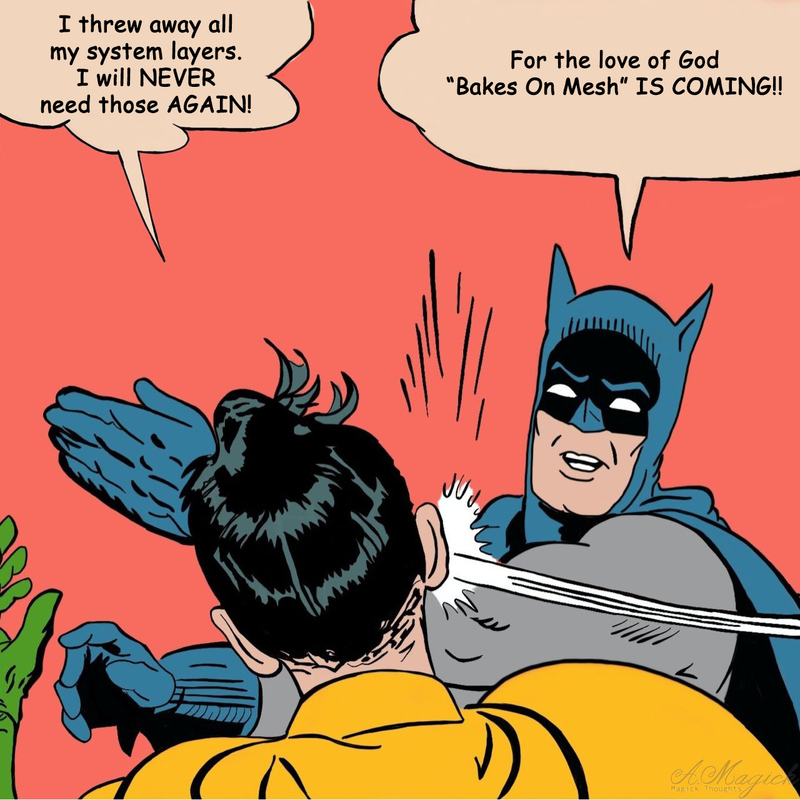 Designers will update to the Bakes On Mesh and so will mesh body creators. Until your mesh body updates to this it won’t work for you I am afraid. Right now it’s in a workaround and will not work like this at all. Also, you will need to download a different viewer to play with it and buy the special omega hud to play. I know, an omega hud? Aren’t they doing away with huds? I said the same thing to myself. But, this is just a workaround to play with this for a bit if you wish to. The final release of this will be totally different. This whole thing fascinates me! This is a huge game changer for SL but so much needs to happen before and during this changeover. Are we ready for it? How many of us have trashed all our old system everything? Are you one of the face smackers right now because you threw everything pre-mesh out? I know my face hurts a bit from smacking myself a little. However, I did keep a lot of things like my Belleza skins and all my Paris METRO Couture clothing…. I am so excited! SO PLEASE DO NOT THROW YOUR STUFF OUT… FOR THE LOVE OF GOD. KEEP IT ALL!!!!!!!! Previous Post Day #2 @ the Kultivate Spring Art Show! Next Post Springtime in Paris ~Paris METRO Couture Second Life~ Find Your GIFT! I’m a magpie, fortunately, so I have all those layers that are going to be really useful soon! Laughs. I save everything I deem of value so I have old makeups, skins, etc…Call me a pack rat. I’ll take that as a compliment! Too true!!! there is so much we have that is still so beautiful and probably best in SL. Soon we will be able to utilize again.